Spotting a photograph of Chorley Sea Cadets in a recent Guardian filled reader Geoff Bolton with many memories. The 66-year-old was one of the first youngsters to sign up. He is pictured on the third row up, second left. He recalls: “I might have been the second or third person to enrol when it started in 1963. “I had great memories of being in the cadets. “We started off in the army barracks in Devonshire Road and after 12 months we moved to Heapey in an old school. 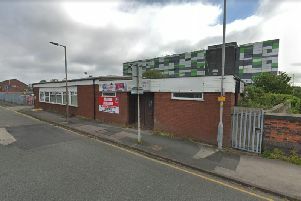 “We then signed on at Chorley Community Centre in Railway Street. “We shared the premises with the army cadets for a few months – they attended on a different night, while we were there Monday evenings. “We did all sorts. One thing I remembered doing was volunteering to go on a week’s course. It cost 10 shillings for one week. “I went on two volunteering courses and really enjoyed them. “I went on the HMS Excellent, at Portsmouth Gunnery School. I did shooting and playing about with missiles. “I was the highest scorer in that place and was featured in the Guardian in either 1965 or 1966. “I really enjoyed doing it and was in the cadets for five years. “It was my mum’s idea – there was nothing else for youngsters to do. Geoff adds he recognises all the faces and can name a couple of people – his best friend Andy Wood back row, second from the right; Eric Wright, bottom row, third from the right. Once he left school, Geoff, a father-of-four with 10 grandchildren, became a trainee manager at a supermarket and then took on employment as a plumber.